Rhino (also known as Rhinoceros or Rhino 3D) is one of the most popular Computer Aided Design (CAD) packages in some industries. Designers and engineers use it to create complex and beautiful product designs with its unique approach to freeform surface modeling. We’ve just launched the RoboDK plugin for Rhino! 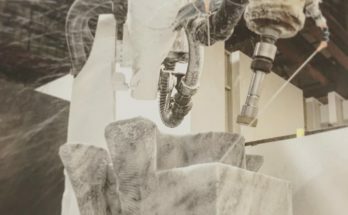 The plugin will be a huge benefit to you if you’re a designer who already works with Rhino and you want an easy way to get into robot machining, 3D printing, or any other robot-based process. It will also be useful for you if you do not yet use Rhino but you are considering it as your CAD package of choice. In this article, we’ll introduce Rhino and RoboDK. We’ll also explain the top 5 advantages of using the two packages together and explain how you can get started. Rhino is a CAD software which is widely used in industries like architecture, product design, industrial design, jewelry design, and more. Its unique ability is that it is a highly-accurate freeform surface modeler which uses NURBS. Polygonal modeling, which makes objects out of a mesh of polygons (e.g. cubes, cones, spheres). The size of each polygon determines the smoothness of the object’s surface. A low-polygon model has a similar look to a photograph with a low number of pixels, i.e: when you zoom in to it, it looks fuzzy. Freeform surface modeling, which describes the surface of objects using curves. This makes the surface smooth no matter how much you zoom into it. Rhino achieves its surface modeling with a mathematical model called NURBS (which stands for “Non-Uniform Rational B-Spline”, if you’re interested). However, you don’t need to understand the mathematics to get the advantages of Rhino. As the team at Rhino explain, many freeform modeling software packages are not accurate enough for manufacturing. However, using NURBS allows Rhino to achieve a high level of accuracy, enough to match any other CAD software on the market. What Applications Are Possible With Rhino? Sheet forming — Rhino’s surface modeling is perfect for modeling complex shapes for sheet material forming. 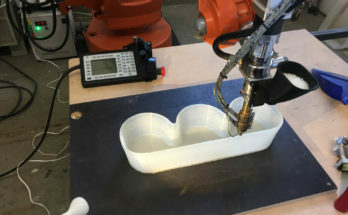 Robotic incremental forming provides a method for producing such shapes. 3D Printing — Rhino is very popular in the 3D printing industry thanks to its ability to create complex shapes very easily using the visual programming language Grasshopper. This was previously a plugin but it was integrated for the first time as a core part of Rhino in March 2018. RoboDK is an offline programming software for industrial robots. It is used by professionals in many industries, including aeronautics, automotive, art and architecture, to name just a few application areas. There are many benefits to using RoboDK. For example, if you work in a manufacturing environment, one of the biggest benefits is that the software allows you to program the robot without interrupting the production. This saves time and money. 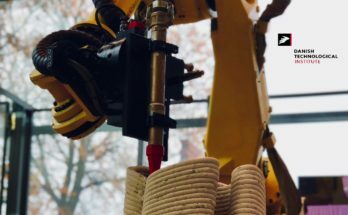 On the other hand, if you work in product design or architecture, the biggest benefit may be the ease-of-programming and the huge flexibility provided by using a robot to construct your prototypes. 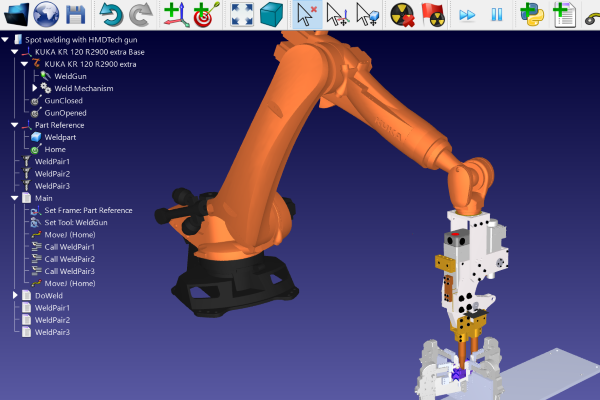 RoboDK makes it very easy to turn CAD models into robot code. It supports over 300 robot models from over 30 manufacturers, which you can access in our Robot Library. The new RoboDK plugin for Rhino allows you to easily use the powerful features of Rhino with the simplicity and dependability of RoboDK. Here are the top advantages to using these two software packages together. 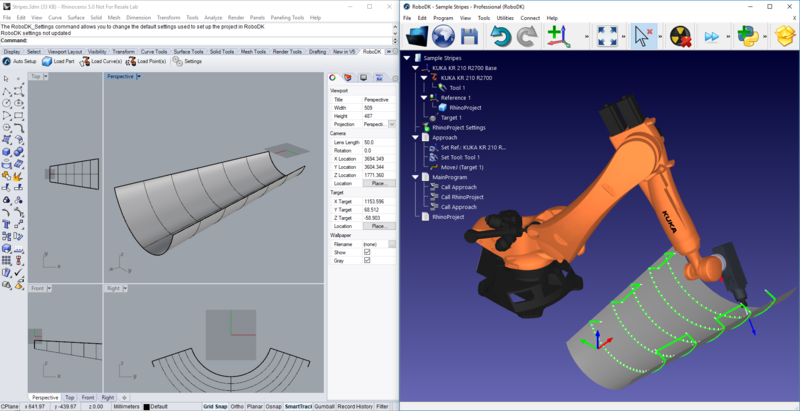 The RoboDK plugin is not the only option available to Rhino users for controlling robots. 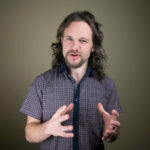 The Food4Rhino plugin directory has a few options for controlling some robot models which vary wildly in terms of features, price, and reliability. The two top advantages of our solution are robustness and reliability. The plugin is not just a stand-alone add-on, as some of the others are. It gives you access to all the features of RoboDK, which is a mature software with thousands of satisfied users. Support is paramount when using a new software. You need to know that someone has got your back if things get difficult. With RoboDK, you can get help quickly by posting your query on the RoboDK Forum or emailing us directly. Some call Rhino “the worlds most versatile modeler.” It certainly is used in an impressive set of industries, from shipbuilding to jewelry design. Combining it with RoboDK allows you to take full advantage of this versatility better than ever before. After all, robots are one of the most versatile manufacturing tools that have ever existed. Even before the new plugin existed, it was possible to export Rhino models to RoboDK. You could export the file to GCode (using the Slic3r plugin) and load this into RoboDK with its Machining Tool. The new plugin, however, avoids this intermediary step. You can work seamlessly between the two programs. 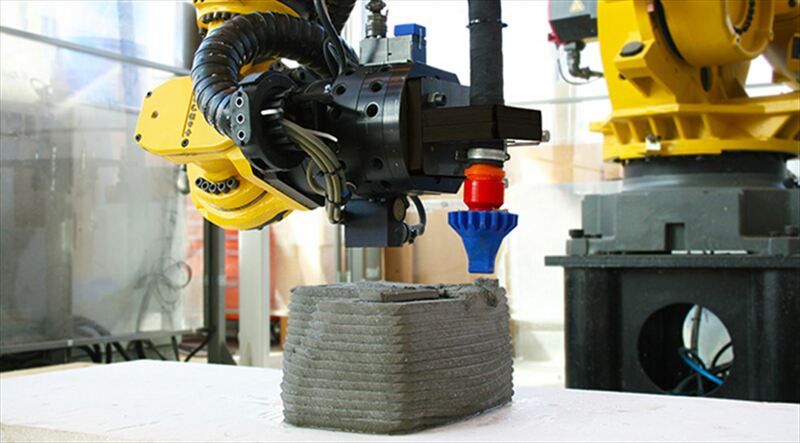 With robot machining, this means you can design and manufacture in a streamlined workflow. A huge advantage of RoboDK in itself is that it allows you to simulate the robot program before you download it to the physical robot. This reduces the chance of costly errors and mistakes. You can manufacture your models directly from Rhino with RoboDK, safe in the knowledge that the robot will act as it’s supposed to. The best way to start using the new Rhino plugin is to head on over to our Documentation Page “RoboDK plugin for Rhino”. The documentation gives a step-by-step guide to installing, setting up, and using the plugin. The plugin also comes with an example project which demonstrates the basics of using the two programs together. Next Article Python vs C++ vs C# vs MATLAB: Which Robot Language is Best?